A while ago I posted about how Thomas confuses the word ‘no’ with a number of other words. He seems to be confident now in that he knows what ‘no’ means, but he hasn’t said the Portuguese equivalent of ‘não‘ yet. He still calls white vans (or anything that remotely resembles white vans, like ambulances) ‘Noel’ after my brother who has his own white van back in the UK. And at times it still sounds as if he is saying ‘I know’ when I am convinced that he is just producing sounds for the sake of it. We now have another sound that is causing some confusion: ‘poo’. 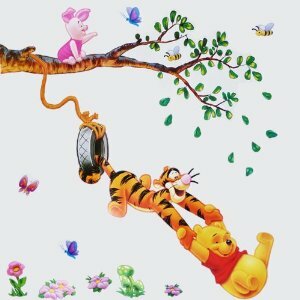 The first time he learnt this word it was for Winne the Pooh, and usually when he says it it is because he is looking for ‘Pooh’ to play with. Recently, though, he has become aware of his own bodily functions and will sometimes point to his nappy and say ‘poo’. He looks very sheepish when he does this. If I ask him if he has done a poo he shakes his head and tries to turn away from me. Related to this is the Portuguese word ‘pum’ which is a kid’s word for ‘fart’. He thnks it is hilarious when he does a ‘pum’ but is very confused when my wife tells him the word. And finally there is the word ‘pooh’ used when people smell something really bad. Obviously, one of the times I use this is when I have to change his nappy, which makes sense to him. It doesn’t make sense when I pretend to smell his feet after he has taken his shoes off and I shout ‘poooooh’ and wave my hand in front of my nose. It must be all very confusing. Thomas still only has a few active words in his vocabulary. 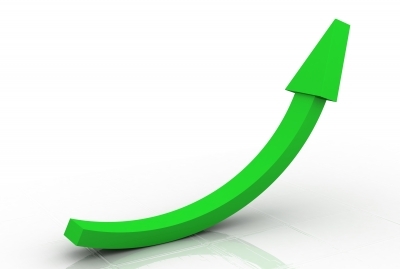 His passive knowledge is increasingly rapidly and he will often respond to what you say or ask him appropriately. However, I reckon he still only has about 20 words that he uses himself, and most of those are names of people or cartoon characters. To be honest, there is a part of me that is hoping it stays that way for a while longer yet, and purely for selfish reasons. Despite only having a few words he doesn’t seem to stop using them. When we are walking down the street he names all of the cars according to who they remind him of. If he sees a grey one it is ‘mamãe’ because mommy drives a grey one. If it is a white one it is my brother, if it is a 4×4 it is ‘vo vó’ for ‘granny’. When you open the fridge he names all of the drinks according to who usually drinks them. Beer is ‘daddy’ (I was quite impressed with this one) as is full fat Coke. Diet Coke is ‘mamae’ and milk is ‘ma má’ (a phrase used to ask young babies if they want to drink some milk, as in ‘Do you want to ma má’). He knows who all the shoes belong to, and if he sees some on the floors, picks them up and repeats the name of the owner, over anf over again until you put them away. And so on. Even when he doesn’t have anything to say, he will either babble the words he knows to himself or just come out with random sounds. He seems to also alter his intonation patterns depending on if he is concentrating on something or is a bit worried about something or is happily drinking his milk. The sound is the same, a sort of /mmmm/ but he changes the direction of the intonation and length of the sound depending on what he is doing. I am pretty sure at the moment that when he actually starts talking for real he isn’t going to stop. He is going to be a right chatterbox and, between him and his mother, I am not going to get a moment’s peace. Does anybody have any experiences with a child who babbled a lot and went on to be a chatterbox or does it mean absolutely nothing? Can an infant who babbles go on to become a quite child? Thomas has quite an extensive library. My brother went around a lot of charity shops when Thomas was born and bought basically whatever he could find. My mother loves nothing more than buying books for children and I have a few favourites that I have picked up as well. Most of the books we have are in English because the books in Portuguese just don’t seem to be as good. They are usually translations and so they don’t seem to be able to play with the sounds and the rhythm to the same extent. Most of the books we have found that have been written originally in Portugese are too serious, with long stories and lots of text. 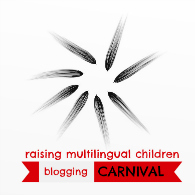 Maybe we are missing something, if so I would love to hear some suggestions because both my wife and mother-in-law would love to read more in Portuguese to him. Until recently we have only been able to use the very basic books for young children. They are usually made of cardboard and have one word at most on each page. The problem with the bigger books was that he didn’t have the concentration span to sit through one and was more interested in ripping the pages apart. In the last 6 weeks, though, this has all changed. 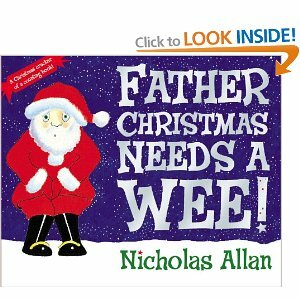 One book that he has really taken to is ‘Father Christmas Needs a Wee‘ by Nicholas Allen. He hasn’t really interacted with any of the wonderful pictures yet, but he often points to it to get me to read it to him. 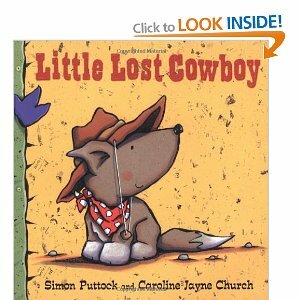 A book that I picked up the other day for the first time is ‘Little Lost Cowboy‘ by Simon Puttock and Caroline Jayne Church. The story is about a young Coyote that gets lost in the desert. He gets advice from different characters that he encounters about how to find his way home. Each time, of course, something goes wrong and he ends up howling ‘AROOOOO!’. The first time I read it I really howled out loud trying to do a passabe impression of a wolf, and T was enthralled. Every time I did it he would copy me, so that it sounded like to wolves howling together. My wife came home and we ended up howling as a pack. Since then Thomas has been pointing to the book all the time and howls along with me with a huge grin on his face. If anybody has any recommendations for books to use with infants I would love to hear them in the comments section. They can be books in either English or Portuguese. The other day, T learned his most important word. Unfortunately for him it is probably going to lead to a lifetime of disappointments and sacrifices, with only the occasional glimmer of hope that will undoubtedly be cruelly extinguished almost before it has had time to sparkle into life. The word is ‘Blues’ and is the nickname of my football time: Birmingham City FC. I know I shouldn’t encourage him to support them as it is probably a form of torture or child abuse, but I would be over the moon if he did. If he doesn’t I won’t be too upset, so long as he doesn’t support that lot from the other side of the city. He started the saying the word when repeating what I had said to him. This morning he pointed to a blue car and said ‘blue’. I am not sure if he was referring to the car or the colour as he hasn’t said it for anything else yet. I am mighty proud, though. Posted on January 8, 2013 by Stephen Greene Tagged ChristmasFather ChristmasPapai Noel	CommentsNo Comments on Merry Christmas! It’s a little bit late, but T seems to have figured out who Father Christmas is. If he sees an image of the big man he says ‘Papai’ which means ‘father’ in Christmas but is also part of ‘papai Noel’ or ‘father Christmas’. He also knows how to say ‘ho ho ho’ whenever he sees him as well.